This treatment smooths away fine lines. It's been touted as a miracle skin care procedure in recent years, but Botox side effects might put a damper on the enthusiasm. Is the treatment worth it? Let's find out. By now, you've probably seen the word Botox in magazine advertisements and articles, on television news reports and on the faces of the rich and famous. What exactly is Botox? Essentially, it's considered a godsend in the ever-continuous battle against the aging process. Botox is a compound drug formulated to paralyze overactive muscles. In the skincare world, Botox is injected into wrinkles. It is renowned far and wide for its ability to relax frown lines, crow's feet and eyebrow wrinkles, as well as lines on the forehead, around the mouth and on other areas of the face. A treatment session is usually quick and relatively painless, and consists of several short injections in the specified area. The results of Botox are staggeringly dramatic. Many users report a visible difference within just a few days of the treatment, and usually survey the results as moderate to better. While it's true that a visit to the doctor's office is never a walk in the park, it should also be noted that Botox is generally considered one of the easier procedures to undergo. Anesthesia is not required prior to the treatment, although your doctor might numb the area with an ice pack or anesthetic cream. Typically, Botox treatments are extremely quick and may take as little as five minutes to complete. This is because they consist solely of a few tiny injections, inserted directly into the muscle tissue associated with the wrinkle. The pain is minimal - it is often likened to a bug bite or the sensation of plucking eyebrows. There is no recovery period required following a Botox treatment. In fact, the majority of patients are able to continue about their normal daily activities immediately, and there is generally no cause for downtime or worry. While the results might seem miraculous, they are not permanent. 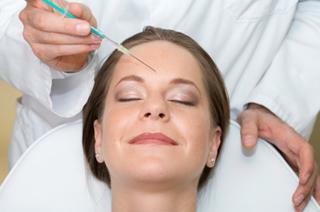 Botox patients can expect a gradual return to the skin's previous state within four months. Discontinued treatment will eventually result in skin that looks just as it did prior to the procedure. Continuing the treatments, however, will ensure line-free skin for the duration of the cycle. In extremely rare instances, the paralyzing effect may spread to other muscles in the area of the treatment site. When this occurs, these neighboring muscles may become temporarily paralyzed, which in turn may lead to a form of facial paralysis (such as drooping eyelids). Certain over-the-counter medications may also interfere with Botox. Your usage of any OTC products should be discussed prior to your Botox treatment. Avoiding these side effects is possible! Be sure to choose a qualified cosmetic surgeon with extensive experience in administering Botox. Also, avoid rubbing the treated area for at least 12 hours following the procedure. This will usually help prevent Botox from spreading to nearby muscles. Botox is generally considered a safe, effective procedure with little risk of serious side effects. Minor side effects that may occur will usually subside within just a few days. As with any medical procedure, discuss your concerns with an experienced professional.